Cover of "Magic Theatre" artwork by Design Team Member Sarah Whitmire. 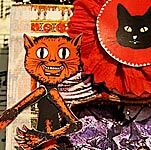 A devil, a demon and a cat (all repeated twice - in 2 different sizes) with separate body parts for hinging together (to pose them or, if you're really brave, to make into mechanical jumping jacks). There are small versions of what the finished "dolls" should look like (and a couple witches). Artwork shown above is by Design Team Member Kristin Batsel, also using images from the Skeleton Slides, Slide Mailer Gothic Arches and Skeleton Slide Mailers Collage Sheets; a Slide Mailer; Red Fleur Dresden Borders and Black Mini Brads.